Cougar Helicopters Inc. operates a fleet of modern Sikorsky S92 helicopters in both offshore passenger transportation and Search and Rescue (SAR) roles. The S92 helicopter is a trusted and proven aircraft around the world, as of 2016 the global fleet had flown over one million flight hours. The fleet of Cougar S92 helicopters is configured with real time position monitoring that is tracked through our 24/7 dedicated type B dispatch department; as well as, flight data monitoring equipment that is analyzed after every flight. Cougar Helicopters operates out of a state-of-the-art heliport, hangar and dedicated SAR facility, which has a proven 24/7 365 response posture of being airborne within 20 minutes. The world class training our flight crew receives is completed in one of the most advanced flight simulators provided by CAE which is located in St. John's, Newfoundland & Labrador. Having the simulator co-located in the same city as our main operation, allows our crews to conduct recurrent training every month. Cougar Helicopters is a recognized and respected leader among helicopter operators throughout the industry by always remaining proactive in the advancement of flight safety. 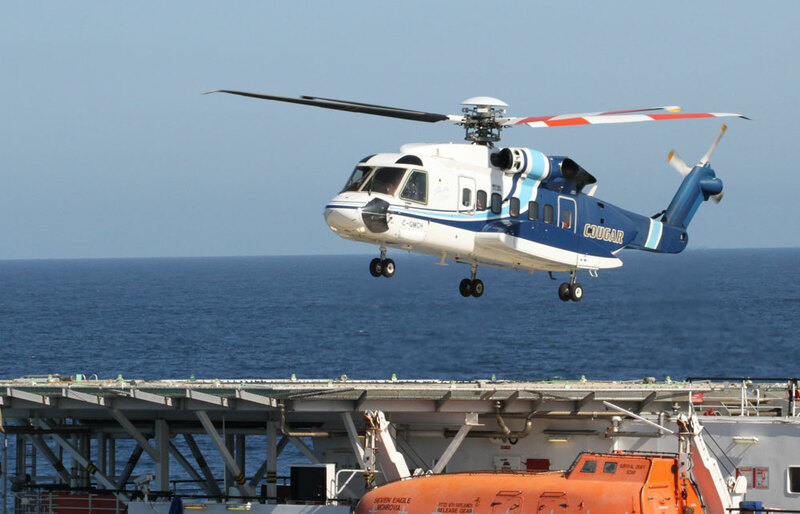 Cougar Helicopters has been providing Search & Rescue (SAR) services since 1991 to the oil and gas industry. Operating from a purpose-built 27,000 sq. 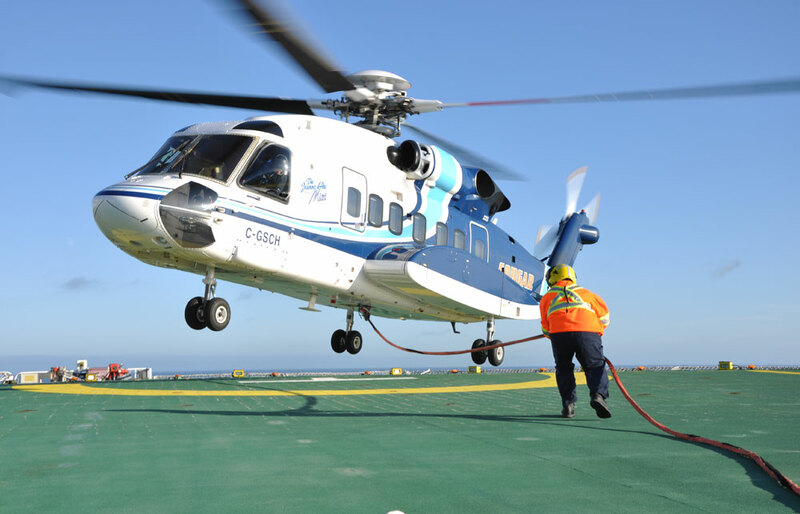 ft. facility in St. John's, Cougar team of professionals provide 24/7 SAR capabilities to its offshore oil and gas clients with a dedicated Sikorsky S92 aircraft. Safety is Cougar's number one priority. Cougar operates to strict company standards supported by a Transport Canada approved Operations Manual and Standard Operating Procedures specifically written for SAR operations. Cougar is the first rotary-wing aviation company to employ a Transport Canada certified Type B Co-Authority Flight Dispatch System thereby adding another level of safety for its customers. 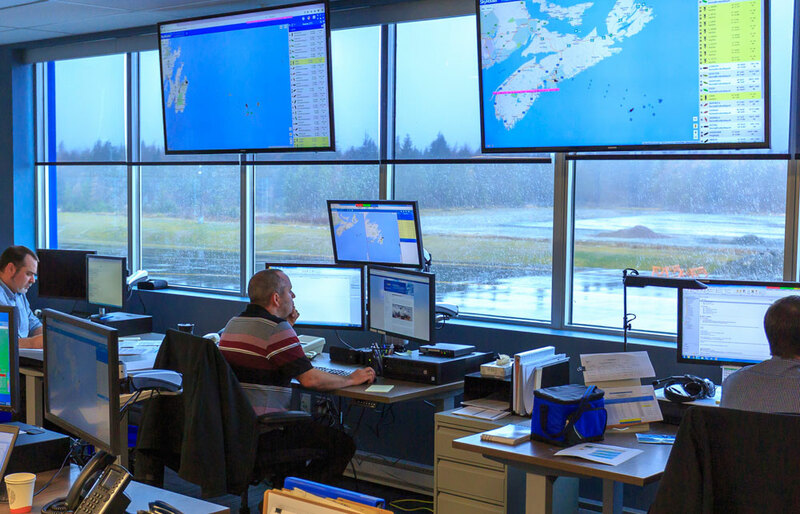 The Operational Control Centre (OCC) brings together all pertinent departments in one area increasing situational awareness for any occurrence. When saving lives you need a helicopter you can count on. Cougar helicopters was the first operator in North America, civilian or military, to utilize the S92 in a SAR role. Built for all weather safety, it has fully redundant systems for flight and engine controls, avionics, cockpit displays and electrical systems. Some of the technical and safety innovations incorporated into the aircraft include GPS technology; de-icing systems; satellite communications/tracking systems; helicopter flight data monitoring; SAR Automatic Flight Control Systems (AFCS); forward looking infrared (FLIR) system with a designated cabin console; and a stand-up cabin that can accommodate auxiliary fuel tanks, medical litter kits and storage space. Cougar Helicopters takes great pride in its SAR crews. Cougar's rescue specialists come from diverse backgrounds which include military and civilian SAR, flight paramedicine, safety and advanced medical systems and survival instruction. Its SAR crews are unique in that many commonly hold dual qualifications as rescue men and hoist operators. As well, cougar's flight crew has experience that includes military and civilian SAR from three continents. They also have extensive Arctic and shipborne operational experience. Cougar is capable of responding to a wide variety of emergencies on land or at sea and in some of the world's harshest weather conditions. 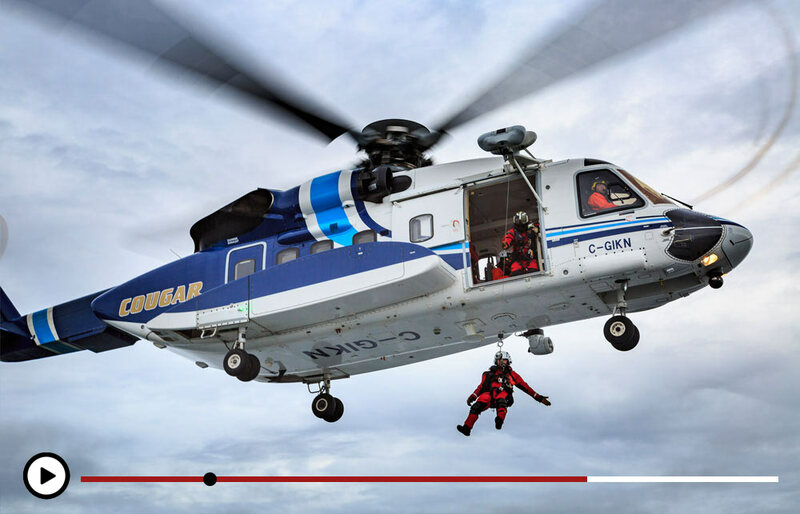 Cougar Helicopters is a past recipient of the prestigious Excellence in SAR Innovation award by the National SAR Secretariat. Cougar's Operational Control Centre (OCC) operates 24/7. All Cougar commercial, Search & Rescue (SAR) and medevac flights are planned, supported and satellite tracked through the OCC by Transport Canada certified flight dispatchers. Marine support vessels under contract to Cougar's offshore oil customer are also GPS tracked and monitored. Leading the way for rotary wing operators, Cougar is the first such company in North America to employ a Transport Canada certified Type B Co-Authority Flight Dispatch System. The implementation of this system, wherein a Transport Canada certified flight dispatcher and the pilot-in-command share responsibility for decision making, adds another level of safety for customers. Once airborne every flight is continuously monitored and pilots are provided up-to-date operational and environmental updates through the OCC flight following system. OCC is collocated with the Maintenance Control Center (MCC) which provides flight dispatchers immediate access to a single point of contact when determining aircraft availability and when engineering expertise is required. Situating these resources in one location allows rapid access to all required information. This heightened situational awareness allows the OCC to efficiently provide high quality, accurate and timely information ensuring safe, efficient flight operations. Offshore installations travel the globe, and safety regulations vary from country to country. As part of Cougar's commitment to safety, it conducts a thorough examination of all contracted helidecks before beginning flight service. Some of the most stringent helideck regulations worldwide are the British CAP 437 regulations. 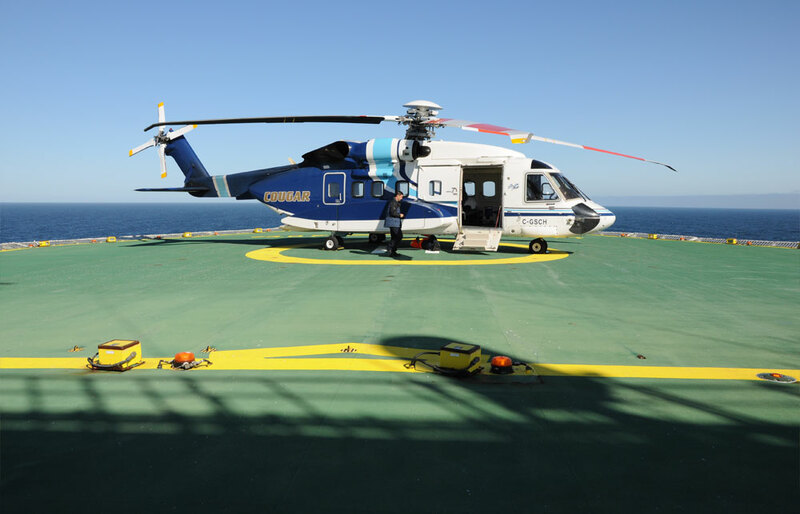 Cougar uses these regulations, in conjunction with the Coast Guard TP4414 regulations, as a reference for offshore helideck surveys. Offshore installations are often located at a significant distance from base. While flight plans are created with an allowance of more than enough fuel to bring the aircraft from base, to offshore, and back to base without refueling, the ability to refuel an aircraft offshore is a benefit when traveling to multiple installations. Cougar inspects all Helifuel tanks which will be used to refuel its aircraft, and maintains a closed-loop system on these tanks between base and offshore. Since 2000 Cougar Helicopters has been safely and efficiently conducting precision flare tip replacements. Working in partnership with Norway's Vertech Offshore AS - the only company globally certified for helicopter conducted flare tip change-outs, this highly productive partnership has successfully completed flare tip change-outs for global offshore locations. © 2017 Cougar Helicopters Inc.